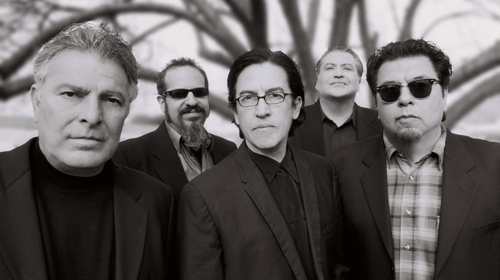 Pub photo for Los Lobos, who will be headlining the 10.14 Garfield Benefit Concert. There will be no stories about a neighborhood rallying to rebuild the Garfield High School Auditorium coming out of East Los Angeles–– nor a sidebar about small tables set up by students selling Bulldog shirts and hats to make a few extra dollars. It appears that early on, the Los Angeles Unified School District took over the concert to benefit the destroyed auditorium, now being held at the Gibson Amphitheater at Universal CityWalk and produced by the House of Blues. Not quite the neighborhood Los Lobos sang about in 1990. One can see how LAUSD wants to maximize the generosity of East L.A.'s favored sons, and having a high school represented at Universal City Walk is no small achievement by professional concert organizers. We send congratulations. Yet, you can't help but wonder if the community of East L.A. ––who first spoke of the benefit that prompted Rudy Salas of Tierra and Los Lobos to show interest, Arturo Sneider giving a $25,000 donation, and Bank of America setting up an account to send funds–– was left behind. According to a May 24 LA Times article (that reported that the original plans for James A. Garfield High School were found in the LAUSD vaults) Los Angeles County Supervisor Gloria Molina wanted the county to assemble a team to expedite the rebuilding process. Also in the article, an added irony, school board member David Tokofsky is quoted as saying "I'm confident of our legal and insurance team, and if the [insurance] contract is what we think it would be, we should be rebuilding back to the richness of that historic building and not a cafetorium or shopping-mall quick build. We're not going to do City Walk Garfield as long as I'm alive." After that, LAUSD took ownership of the benefit and didn't share too many of the other plans with the community––other the actual concert date. Many agree a project like this is too big to be a romantic East L.A. version of a MGM musical, where Miguel Rooney looks straight into the camera and shouts "Hey vatos . . .let's put on a show!" while Guadalupe Garland tap dances in the footprint of a lost auditorium; it could have been a chance for severely underfunded student body to raise a few bucks as well. At City Walk, no Garfield student organization will be allowed to have a fund raising presence like they would have at the original community venue choice of East Los Angeles City College. Dennis Smith, a co-sponsor of the California Scholarship Federation chapter at Garfield High School, shares that idea and adds, "Local businesses lose out as concertgoers will now spend their preshow dollars at City Walk rather than eating the birria at Chalio's or picking up a pastrami dip at The Hat," as East Los Angeles City College is one block west of retail heavy Atlantic Blvd. "Instead, once again we will be cast as the willing recipients of largesse generated from outside the community. That's a shame." Is the Westside (so willing to rename Silver Lake and Echo Park as the Eastside) not willing to venture into the badlands of ELACC for a concert? Even with that, there is an underestimated buying power of Latino concertgoers who are now embedded within the Chicano subculture of East L.A. The important thing, of course, is that the Garfield High School Auditorium is rebuilt, and as close to the historical plans as possible so it can continue serving East Los Angeles. Still, if the student body of Garfield High School had a chance to aid budgets for arts, sports, literature, or even the math club; more than an auditorium could have been built in the neighborhood. Good post Ed. Maybe they should do two fundraisers, one for those with the money that want to help out, and one for the neighborhood and people that want to contribute what little they do have. When was the last time Los Lobos played in ELA proper anyways? A 2nd concert with LL would be improbable since there was already a tight schedule, so maybe someone will consider some sort of 2nd community fundraiser that can still allow further contribution. Every little bit would help, and maybe expand to all of the Eastside. Then again, the Eastside telethon hosted by El Chavo on public access 36 is a programming idea. Can we start a bloger@s for Garfield benefit? Ha. I'm sure we could pool our many talents together. I would've definitely preferred a concert in East LA. It's closer and I know I wouldn't have to deal with paying for parking at CityWalk. Plus, I really don't like the Gibson Amphitheater. Good idea, CindyLu. I can check and see if Bank of America still takes contributions into an account. Los Lobos performed a show at the East Los Angeles College Ingalls Auditorium as a benefit for the ELAC Foundation back in February 2004. A 2nd "community" fundraiser was held last Saturday in ELA.!!! The Garfield Alumni class of 1966 held a local fundraiser (blessed by the school) at Sanctuary Studios (home and business of Lil Ray, 'member?, you 'member)for the auditorium. Local schools danced folklorico, videos of past renuions, food, drinks and of course Lil Ray and his band. So some alumni and friends of the school are taking matters into their own hands and doing what needs to be done on a community level! If there is another fundraiser, let us know. Bloggers will get the word out.